Do you want to expand your business by switching your existing Magento store to a multiple-seller marketplace? 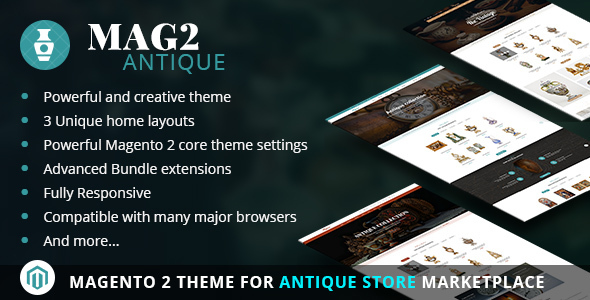 And a Marketplace Multi-Vendor Extension for Magento 2 is an effective solution to make this. With integrating this Marketplace Multi-Vendor Extension, your site will run effortlessly. Ability to approve, disapprove and delete sellers in the admin panel. 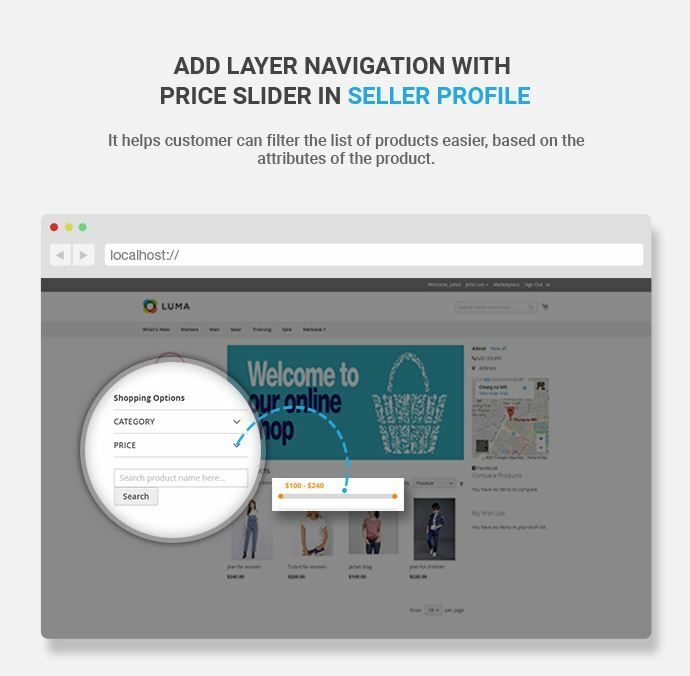 Allow the seller to select for enabling the social media fields on Seller's Profile page. 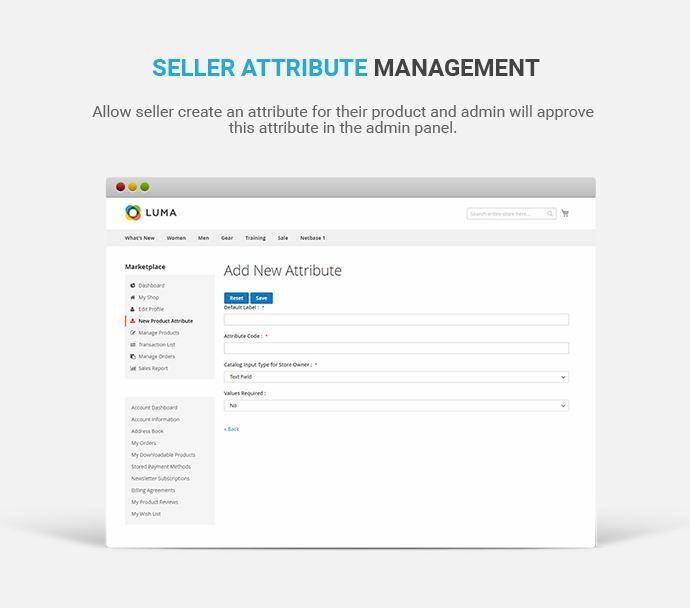 Admin will allow product types that sellers/vendors can add. Admin can choose to auto-approve products or not. Admin can delete, change status ( approve/disapprove) and edit seller products. 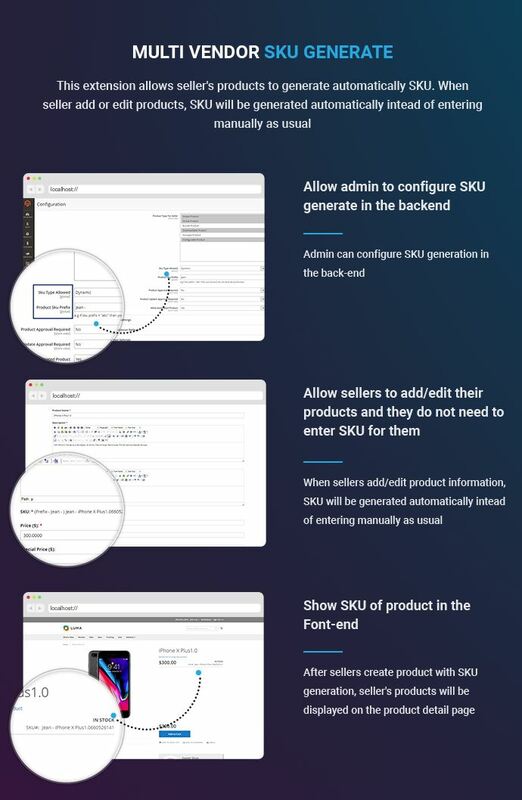 Admin can configure SKU types of the product when sellers add a product in the admin panel. 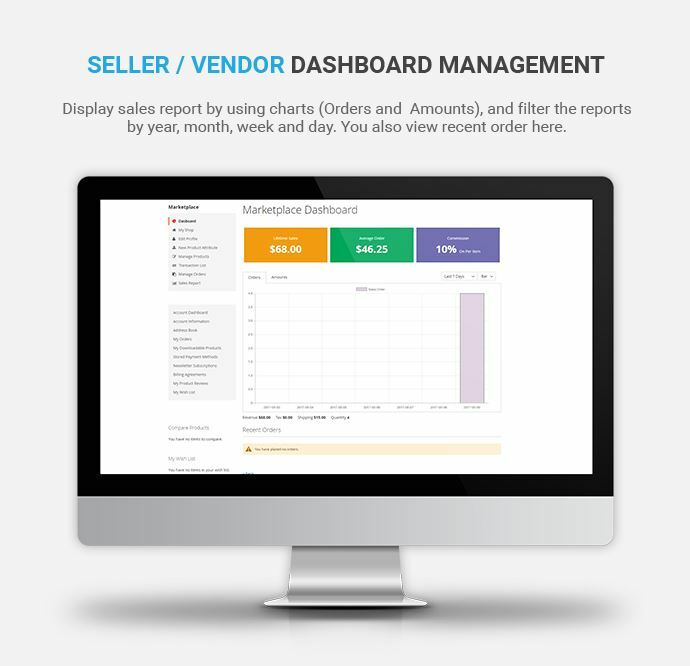 Admin can configure for the chart in seller dashboard. Different seller commission for each seller. Admin can manage all transaction of seller/vendor. Seller can add a banner , shop logo. Manage profile, product details, view commission, view order, payment transactions, and sale report. Get instant notification about orders, products, and payment from admin. 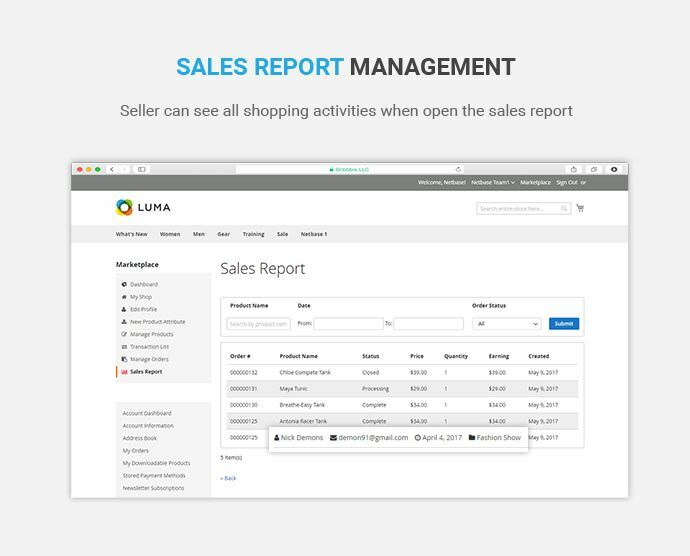 Manage sales report about their shop in their seller account. Show recent order at vendor dashboard. The user can view all the details on the particular product by the seller. Ability to check the availability of stocks of the product from the seller. 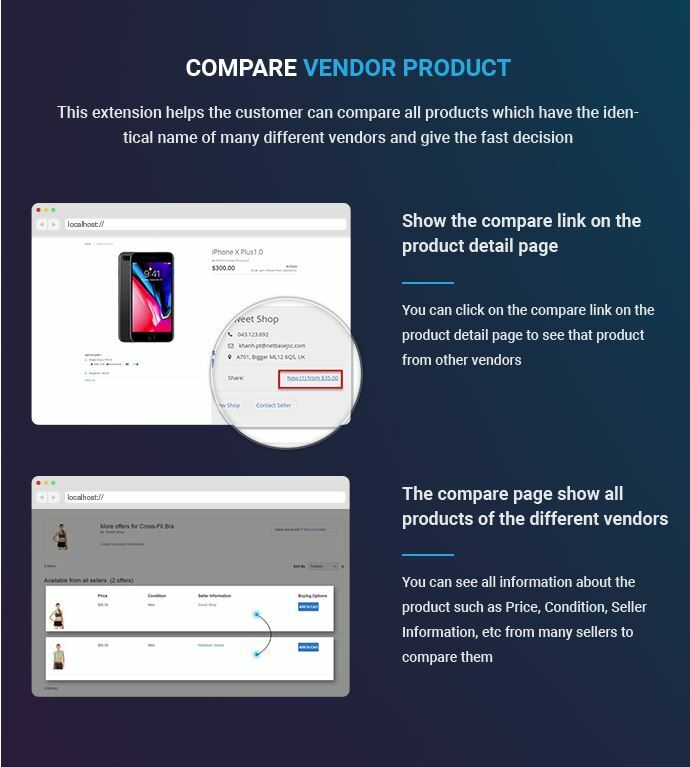 Ability to view and compare prices from several vendors for a single product. Buy products from the different seller shops. Step 2. Register seller/vendor: Go to account, click on " Become a Seller" button -> tick checkbox " Term and Condition" and Submit. Step 3. Approve/Disapprove: The seller will receive mail from admin when admin approves or disapprove. Step 4. 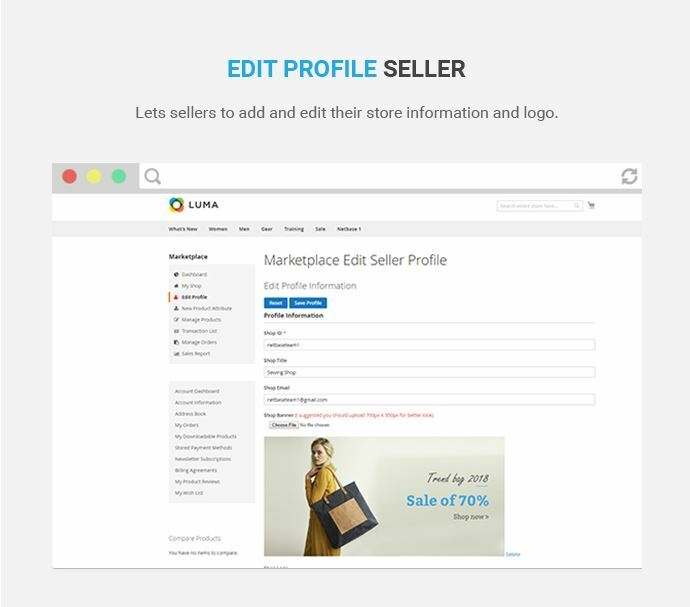 Seller Account: If you became a seller, you had tab: Seller Dashboard, My Shop, Manage Seller, Edit Seller Profile, New product attributes, Manage Seller Order, Manage Sales Report in your account. You can add a new product or edit profile here. Step 1: Go to website. Step 2: Go to Marketplace in the header to find all sellers shop. Step 3: Click on the seller you want in Marketplace page to go to seller shop and buy the product. Step 4: Implement checkout process. Step 2. 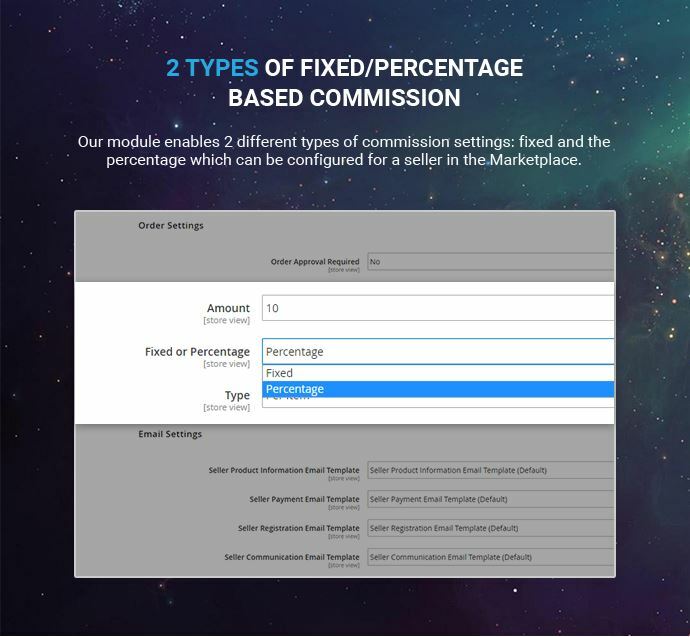 Sellers Management: In admin panel, you click on MARKETPLACE -> Manage Sellers -> tick to select seller you want to change status (approve/disapprove) and delete for this seller or click on "Edit" in Commission column to set commission for this seller and also able to click on seller name to view and edit seller information. Step 3. 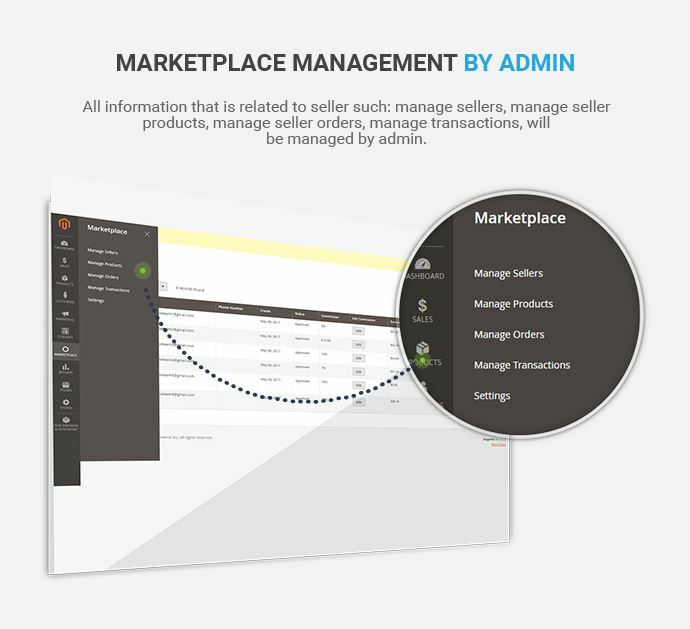 Seller Product Management: In admin panel, you click on MARKETPLACE -> Manage Products-> tick to select the product you want to change status (approve/disapprove) and delete for this product or click on product name to view and edit product information. Step 4. 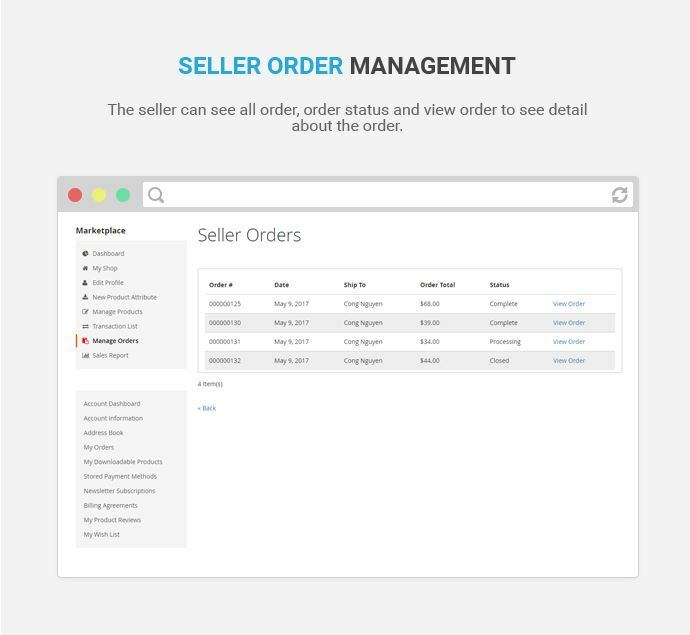 Seller Order Management: In admin panel, you click on MARKETPLACE -> Manage Orders-> tick to select the order you want to delete or click on View to view order and changes order status. Step 5.Transaction Management: You can view all transactions of seller/vendor here. Step 6. Configure extension: In admin panel, you click on MARKETPLACE-> Settings and setting something about this extension here. Remembering Save Config after each change. Step 7. Go to front-end to view changes. 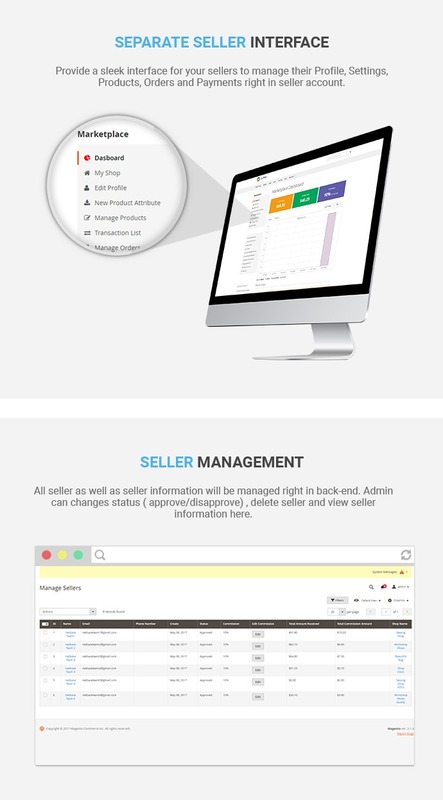 Seller Management: All seller, as well as seller information, will be managed right in the back-end. Admin can changes status ( approve/disapprove), delete seller and view seller information here. 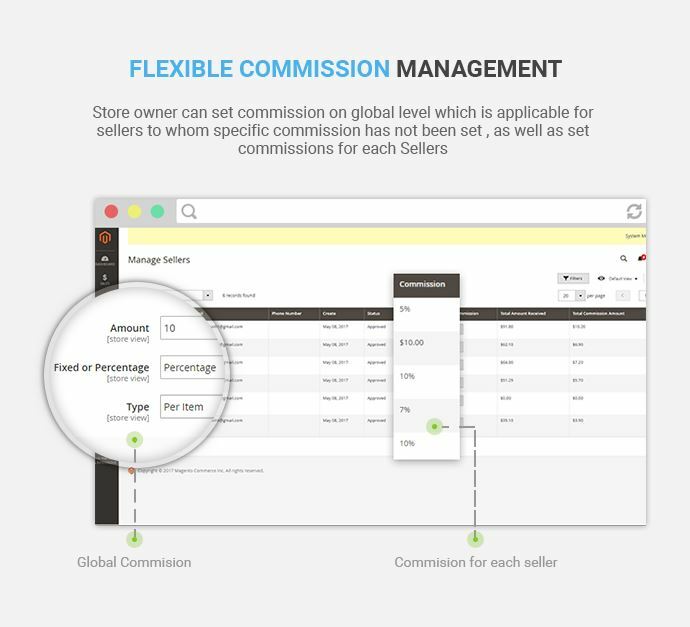 Flexible Commission Management: Store owner can set commission on global level which is applicable for sellers to whom specific commission has not been set, as well as set commissions for each Sellers. 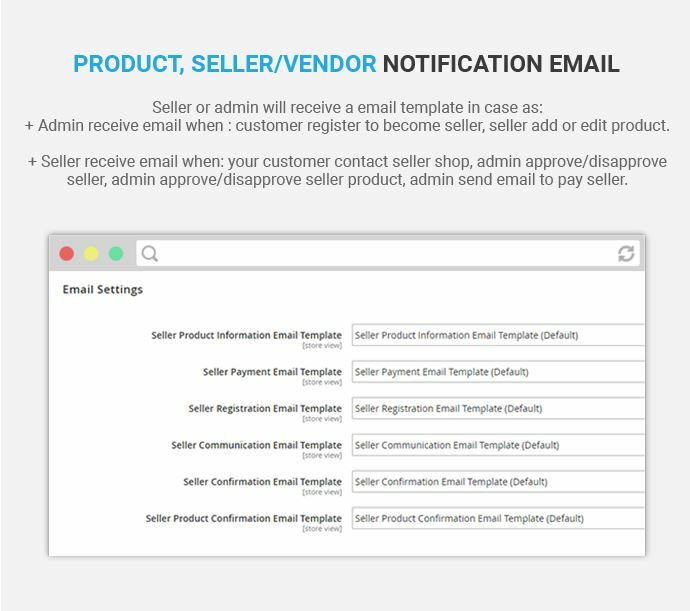 Product, Seller/Vendor Notification Email: Admin receive an email when customer register to become seller, seller add or edit a product and seller receives an email when your customer contact seller shop, admin approve/disapprove seller/seller product etc. 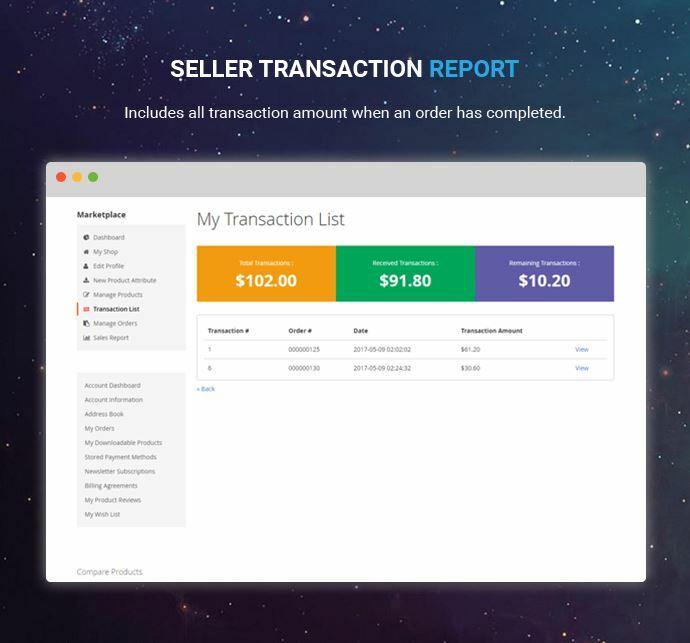 Seller Transaction Report: Includes all transaction amount when an order has completed. Multi currencies & language support: Support for multiple languages and currencies is available. 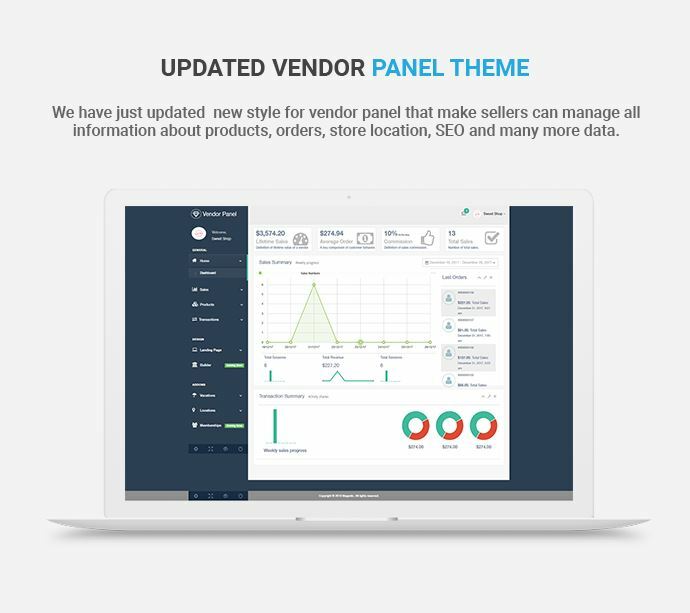 New vendor panel theme: Seller can manage information about products, orders, the location of the shop, the holidays, ... easier with friendly interface, easy to use. 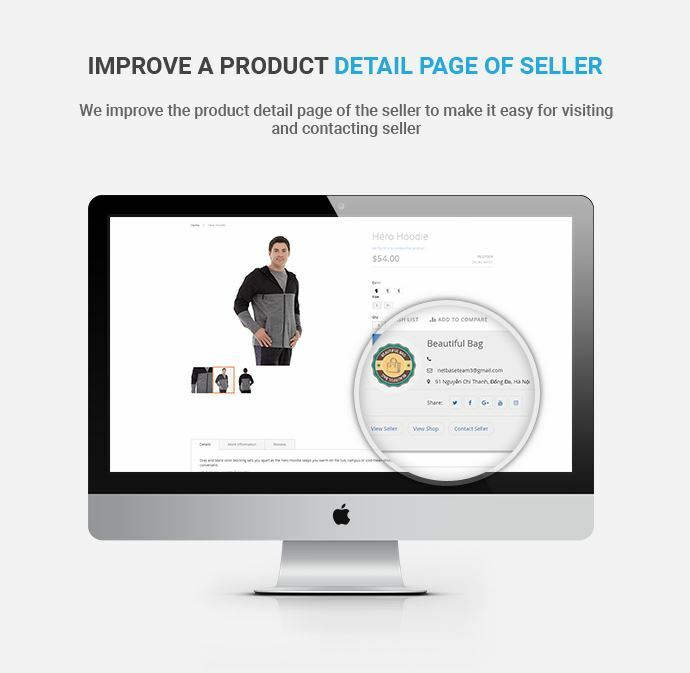 Improve seller profile in product page: It is easy to sellers and customers can visit seller page, shop page and contact with seller easier. 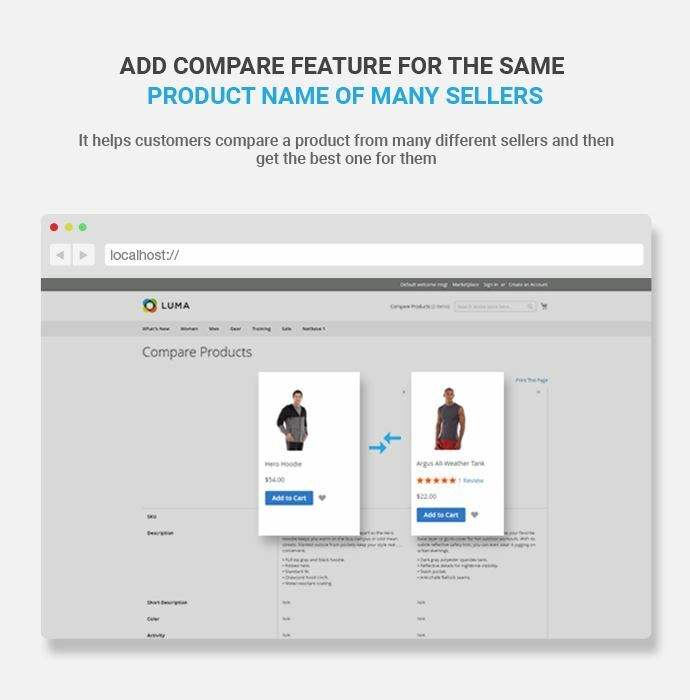 Add compare the same seller product page: It helps customers compare between products, then they can buy the product that suits with their. Create new product with the name already exist: It helps customers compare between products, then they can buy the product that suits with their. Vendor SKU generate: It helps customers compare between products, then they can buy the product that suits with their. 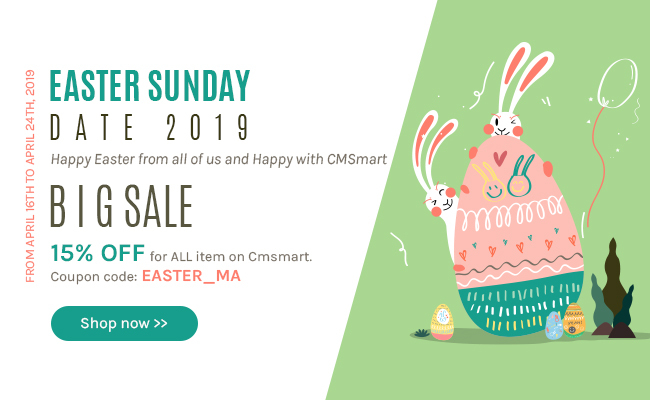 Marketplace Seller Vacation for Magento 2 is a useful module for Magento2 Marketplace Module, which sellers can notify their customers through the message and disable type in the shop when they are on vacation. Vacation Settings For Seller: Allow seller setting some vacation information for the shop as: vacation message, vacation time, disable types and vacation status. 2 Types of Disable: Allow sellers setting 2 type as "product disables" or "adds to cart disable" when they are on vacation. 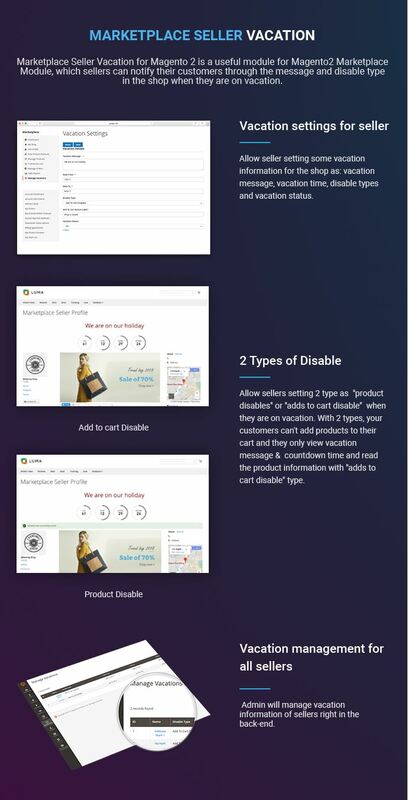 With 2 types, your customers can't add products to their cart and they only view vacation message & countdown time and read the product information with "adds to cart disable" type. Vacation Management for All Sellers: Admin will manage vacation information of sellers right in the back-end. Marketplace Seller Product Video for Magento 2 allows sellers upload videos for any product from URL ( Youtube and Vimeo) to get much information about each product. 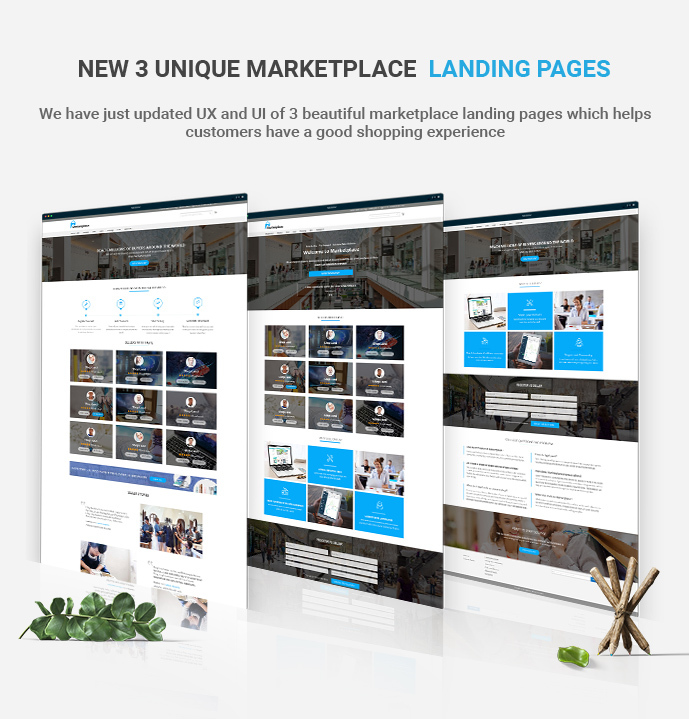 This is is an effective marketing and improves user experience for your website. Upload Video for Each Product: With all product types, the seller can upload the video for any product they want through clicking on the button "Add Video" when they add/ edit product. After uploading video successfully, your customers will view the video in product detail page. Support URL Link: The seller can upload link video from some popular sources as Youtube and Vimeo. Automatically Update Video Information: After you enter video link, you move the mouse to go the next field, all information about video will automatically update. Preview Video: After you enter video link, you will see " Preview Video" next to the right of "Add New Video" form. You will know some video information as title, uploaded time, uploader and duration. You can click icon play to preview video. Allow Upload Preview Image: You can upload preview image for video. 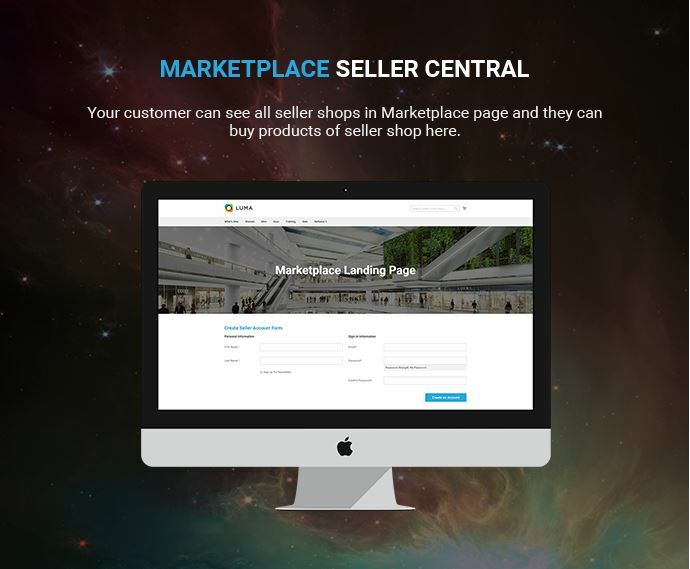 Marketplace Seller Store Locator for Magento 2 show all seller stores in one single map and customers can quickly find a store location nearest them and obtain directions. Show the full list of sellers: Your customer can see all sellers store location on the map which presented by the manufacturer icon or listed in the left sidebar with all necessary information about the seller's location. 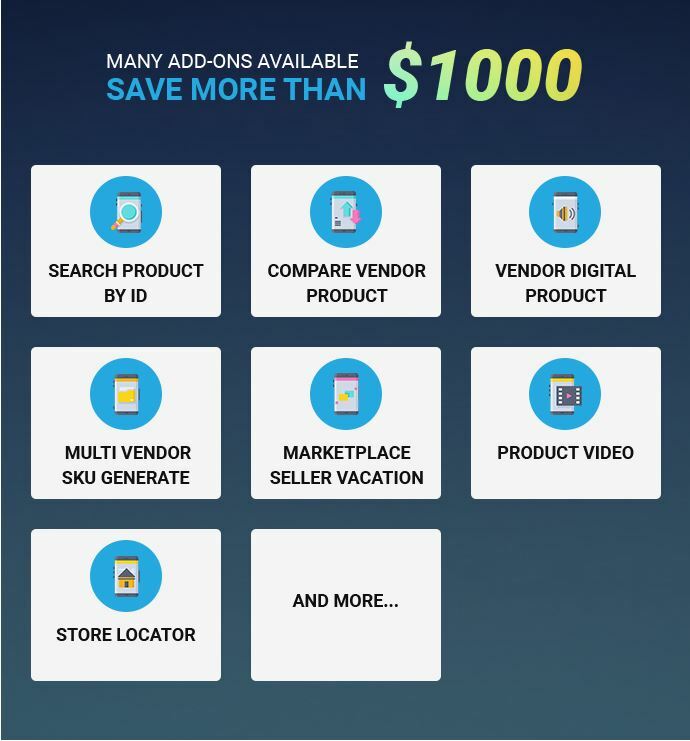 Allow Seller Add Unlimited Store Locator: In the profile of seller account, the seller can add unlimited store locations and select the main location for their shop. View Seller Store Location Information: After you find the location you want, you click on seller store name to go this seller shop. You can see all information about this shop here such as all products, new product, best seller, contact & event. 2 Ways To Search Seller Store Locator: Customers can select 2 ways to search seller stores location: search by distance ( fill a position and drag the radius you want) and search by area (fill in store name & zip code). The search result will display as a list in table "store list" as well as the highlight on google map. Google Map Suggest Address: Visitors just need to enter a few characters in the Address field and all relevant suggestions will be auto-drop down as a list for choosing. 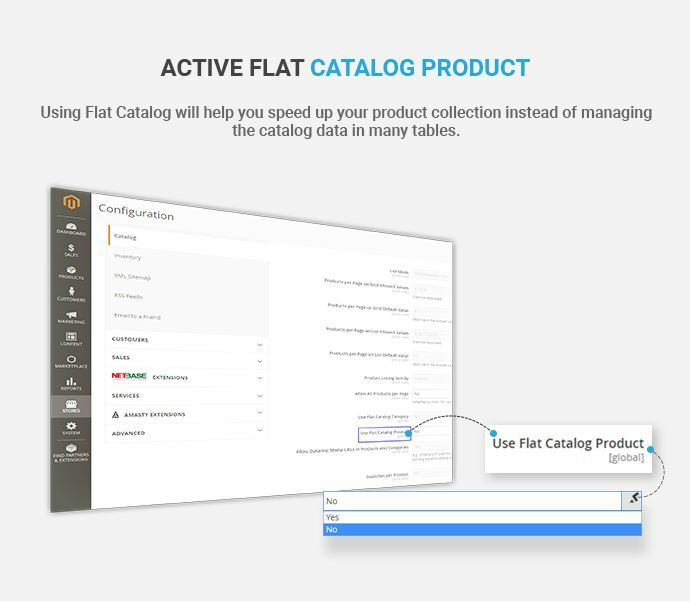 Seller Store Locators Management: Admin can manage unlimited seller store locations in the back-end and they also can add, edit, delete và change status ( enable/disable) any store location there. Automatically Address Fill Form: In the back-end, when admin add an address, they don't need to enter the address manually, they only fill in box search and click this address on Map Then, they click on the " Apply To Form" button, it will automatically fill in the address and coordinate of form. Distance Unit Setting: You can configure the default distance unit right in the back-end. This default distance unit will be the unit when your customers search by distance. Get Direction: Your customer can get the direction to any store from their position by entering other store location and mode of travel like driving, walking, bicycling, traveling etc. They will get shortest directions on the map. Marketplace Seller Search Product By ID for Magento 2 show 2 ways of searching product: by location or by name. 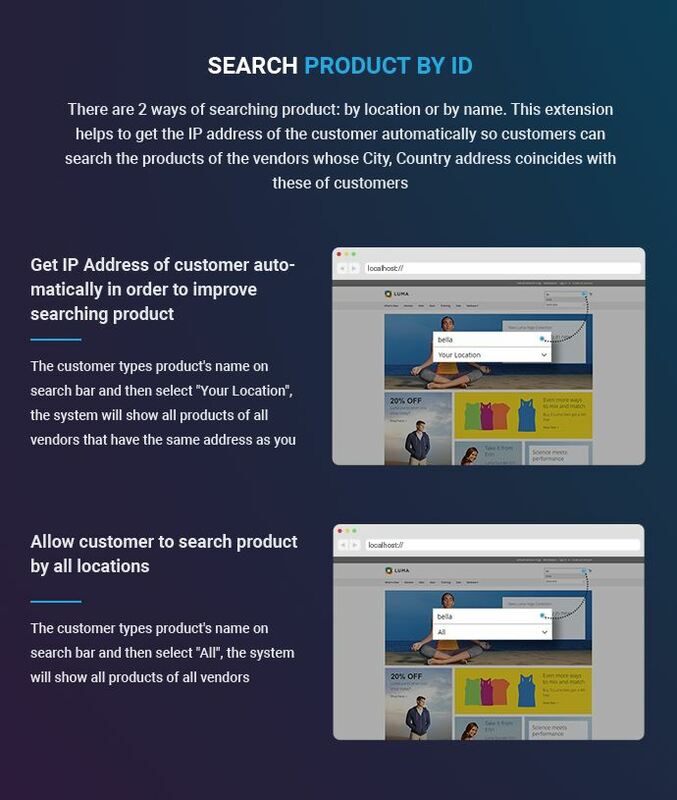 This extension helps to get the IP address of the customer automatically so customers can search the products of the vendors whose City, Country address coincides with these of customers. 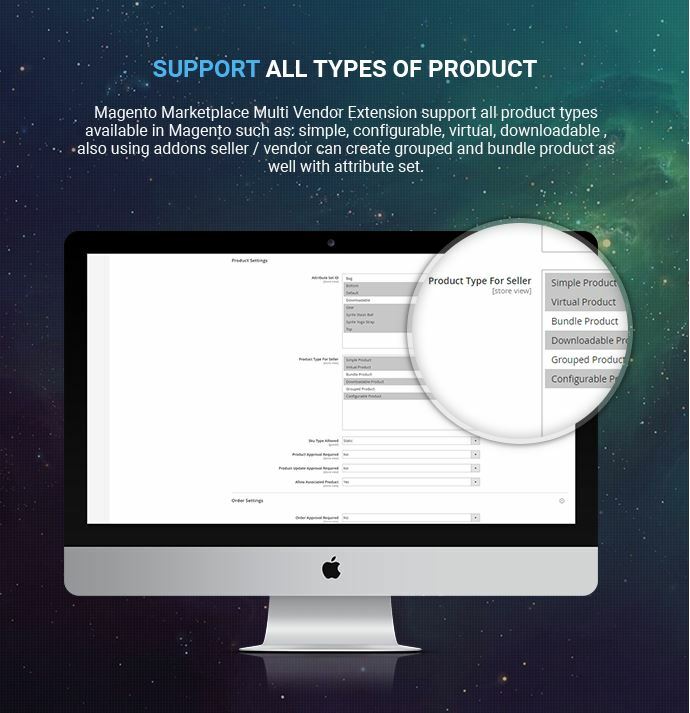 Marketplace Seller Vendor Digital Product for Magento 2 is an extension allows seller add unlimited audio, upload audio for each product, audio will auto save to My Playlist of Customer after buy product. The customer can try listening to have the option to buy products attach or not. Allow to upload audio for each product: When sellers add/edit the product, they can upload the audio for any product they want by clicking on the checkbox named "Is this downloadable Product". After uploading audio successfully, customers will listen the audio on the product detail page. Allow Customer to buy product with one or more audio: Customer can buy product with one or more audio by choosing "Select all"
Thanks you Selena i hope you always be my support you are the best this company has. Thanks you im very happy with you help. You are Amazing. Excellent tech support. Thanks Neo! I am very happy about Neo support thanks you very much! 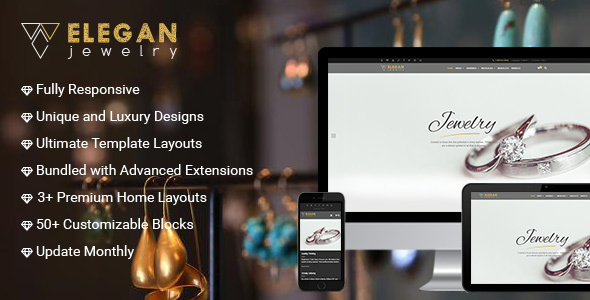 This is the most afforable and easy to install and use ext for my marketplace website. Keep moving guys! This module deserves to be placed in a must-have ext for a website. I've been using it for 7 weeks and the experience is amazing. I am really happy with this module. It is so strong with seller management features. Your customer service is so fantastic as well. Good job, guys! Good. Evan did perfect job helping me. I have to say this Magento module is a real catch. The settings are easy to understand and configure. My marketplace have about 100 sellers are on and it simplifies all managing tasks on my site. So good! My team interesting in feature Builder on CPanel. > When will be imported in extension? > UI & UX IN Builder feature demo please provide link to see You think the same. Currently, our product does not support your request features. 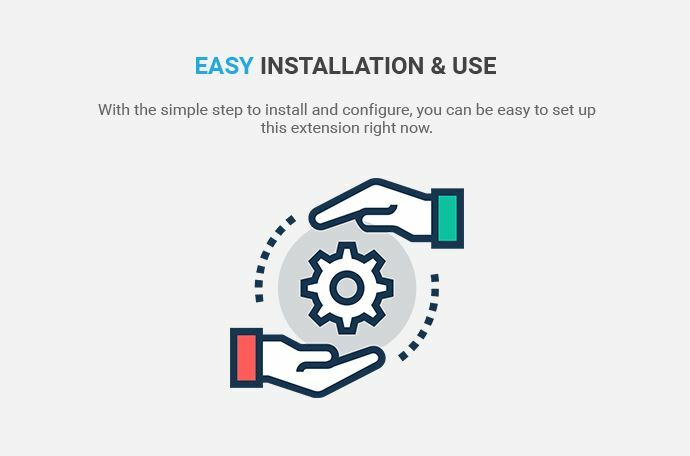 After purchase the extension, you can download the source code of this extension. ** Auto-renewal: You will pay a fixed amount first (239.68$) for the payment to get support, download and upgrade within 6 months. After 6 months, you just need to pay a small fee (for every 6 months) 29.88$ to extend more 6 months of support, download and upgrade ( called renewal fee). Of course, if you do not like to pay the renewal fee, you can cancel it at any time. In this case (if you cancel it), you still can use our product for a lifetime but without our support, download and upgrade. ** Standard Payment: This is a one-time payment $256.46. You’ll pay one fixed payment to get our product. You also get our get support, download and upgrade within 6 months. After 6 months, if you want to extend your support, download, and upgrade, you have to pay 55% of the first price to renew your support, download and upgrade. In case, you do not renew it, you still use our product for a lifetime but without our support, download and upgrade. I have a question about extension can compatible with Magento 2.3? Does not work after design editor 2.3.0 update. Shouldn't you be doing this sooner than any other problem? I'm so disappointed in CMSmart. I started the service by customizing it by paying for various functions. But I'm so upset to see the delay in solving the problem after your complacency update. Why is there a chat service? Is the chat service just a form? I am Vincent from CS and sales department. 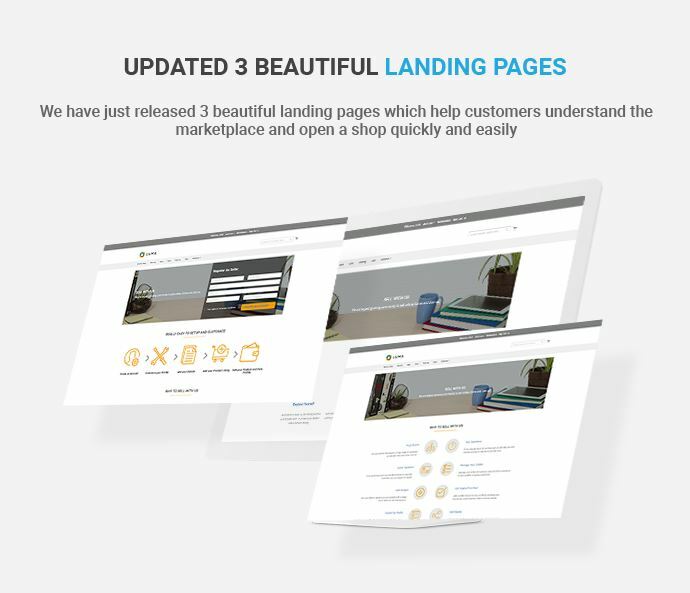 You bought our printshop package with online designer plugin of wordpress, not Magento Marketplace Multivendor module. I also checked in the system, you have just created ticket yesterday at 7:59 PM ( not our working time). Today we will check and give you a satisfied answer for your issue. As per we discussed via Skype, our product is compatible with Magento 2. 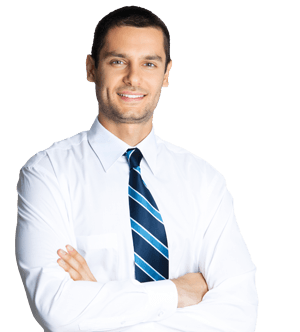 If you have any questions, you can contact me via Skype: Vincent@cmsmart.net for a quick response. can you please update your multi-vendor extension directory, I have installed, but getting this error, I am using magento 2.1. Kindly create a ticket in which you provide us with your admin info, FTP and Cpanel so that I can check and support you. 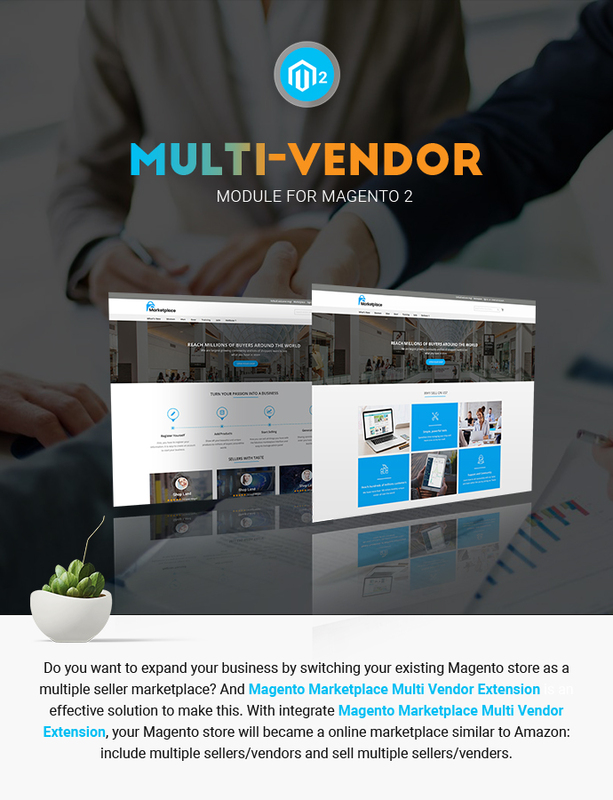 I'm interested in your Marketplace Multi Vendor Module For Magento 2. I'm wondering if it supports RTL languages and if i there is a chance to translate all the Module to make it easy for my sellers. Currently, this plugin does not support RTL language. However, we can make a customization for you. Kindly contact me via Skype: Vincent@cmsmart.net for a quick and detailed discussion. Doing customization may cost me a bit instead of buying it in regular price. Is there anyway i can do it without additional cost?